No matter if you’re an entrepreneur running a business or a content specialist who writes about a product on a company’s website, I think it’s extremely important for you to feel comfortable with marketing. If you really have an issue with promoting yourself, it’s best if you stop thinking about it in terms of “marketing” or “self promotion.” Instead, concentrate on the benefits people can get thanks to using your products or how can you help them with your content. And then let them know about it. Here are several practical tips for how to promote yourself without feeling exposed. If your job is to create content for your company and you’re responsible for promoting your articles, start with providing quality content. It’s best if your content is full of helpful advices wrapped in meaningful stories which are easy to remember. People say that great content speaks for itself but sometimes you need to help it to be heard. How can you do it effectively? Don’t talk about how great your article is but rather what difference will it make in your customers’ life or their business. Focus on what they will learn from your content. In other words, don’t make it about yourself but about what you can do for them. Imagine that someone writes to you directly and says: “I saw you’re interested in marketing, this post will teach you more about lead nurturing. Have a good read!” Then you check out the post and it turns out to be a helpful, insightful and great read. Suddenly, among tons of articles every day, you don’t have to think about what to read, because someone who did their research and found out something about you, sent this insightful article that meets your interests. You can provide value to other people the same way. You’re rarely responsible for your job alone. There are usually other people involved in achievements. If you published an e-book which is full of amazing graphics, it means somebody did their job right. Give credits to the graphic designer, they surely deserve it. It keeps you likeable. You also seem more enjoyable to work with. Which brings me to the next point. Reverse self–promotion and start posting other people’s stuff. How can promoting others help you? It actually might do you a lot of good. First, when other people come to your social media they can see you’re not full of yourself, posting only your content. Second, since you post about something else than your business, they can assume you’ll also appreciate their work. When you post other people’s stuff, make sure it’s valuable content people can learn from. It makes you look good, creates influence and authority. It also activates the law of reciprocity. Besides, that’s why social media was created – to network. Once you establish a relationship with someone and ask them to share your work, they are more likely to do it, than if you reached out to them with this request without any previous contact. 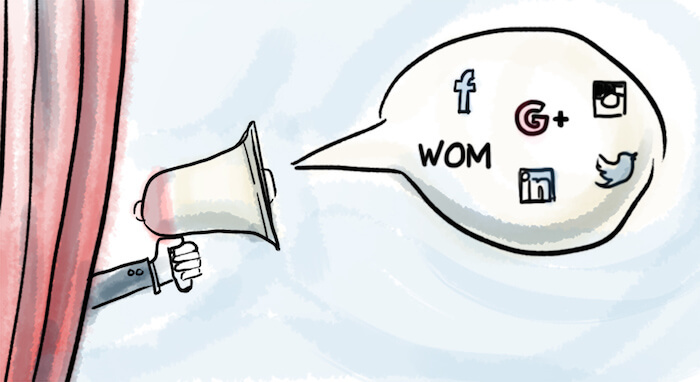 Word of mouth is the best promotion you can imagine. Once you get it, you don’t have to worry about promoting yourself anymore. Other people will do it for you. Stories stimulate the brain and even change how we act in life. Storytelling releases the chemical dopamine in the brain that helps with memory and accuracy. Stories make a deeper impression on your listeners. You can say they’re immersed in the moment with you. If you’re doing it right, of course. So how to kindle a spark that will set up a fire of conversations about you? Well, instead of saying: “I’m great at marketing,” recall a project you worked on lately, that turned out to be successful. Maybe you were responsible for an amazing campaign, that required a lot of creativity and it actually went viral on social media? While people may hear you saying “I’m great at it,” telling them a story allows them to feel it for themselves. They also won’t be able to tell the same story without mentioning you, right? Check out the post Word of Mouth Quotes and What You Can Learn From Them. If self–promoting is hard for you, you’re probably far from bragging. But sometimes your reluctance to promotion can be seen like conceit. How is that possible? This way you highlight your strengths without being received in a bad way. I admit that you need to open up a little bit to do that, but knowing that it will make other people feel good about you probably helps. You know what else can help you to promote yourself? Talking about yourself might be hard, especially if you talk to the people you’ve just met. Imagine you’re at a party in a room full of people you don’t know and everyone asks you: “so, what do you do for a living?” It’s not enough to say where you work, you need to help them visualize it, so they can see the full image. I’ve noticed, that in situations like this, I tend to answer questions in short sentences. I don’t feel like talking about myself to the people I’ve just met. That’s why I was always thankful for my wingman, who not only extends what I’ve been saying but he also mentions my successes. I want people to know about them but at the same time I’m happy I’m not the one who has to say it. A wingman is fine with you being in the back and still lets you shine. Last but not least, there are your social media channels. Your social media are your business card. Before anyone hires you, they check your profiles on Facebook, Instagram or LinkedIn. They tend to form an opinion about you really quick, based on what they see. (You might want to read the post “How to Use Twitter for Business”). That’s why some freelancers and business owners resigned from publishing their private stuff on Facebook. They want to be perceived as professionals. They publish their work, instead of images from parties, and smart articles that make them look good, instead of entertaining articles to only laugh about. They keep it professional. Whether they like to feel exposed or not, they know they can use social media to their advantage. The other way you can use social media is to let people know you exist by commenting on their work. You don’t even have to put a link to your website in these comments. Oftentimes commenting on the articles in thematic groups on LinkedIn or Google+ is enough to let people know you exist. Self promotion works best when it’s natural and unforced. I hope these tips helped you to feel better with promoting yourself in an indirect way. Today’s online world is very noisy. People brag about what they’ve done, or who they know. Everyone is like: “buy my book!”, “watch my video!”, “read my article, it’s great!”, “I made it, it’s awesome! I’m awesome!” etc. I believe you don’t have to scream to be heard. You can promote yourself in a different, smarter way by providing value and helping people.